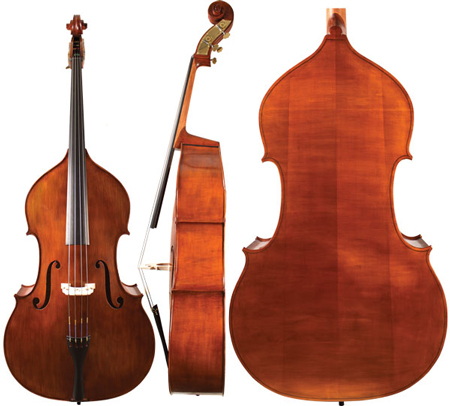 We stock a large selection, but the best way to shop is to contact us by email and let us know a little about which models seem appealing to you in terms of the size, price range, tone, and appearance. 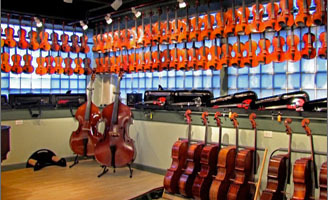 We can use your preferences to make a specific recommendation of instrument our outfit which is in stock. We also offer a 10 day in-home trial. So, please do not hesistate to contact us. There are no stupid questions. We love email. Thanks in advance for contacting us. 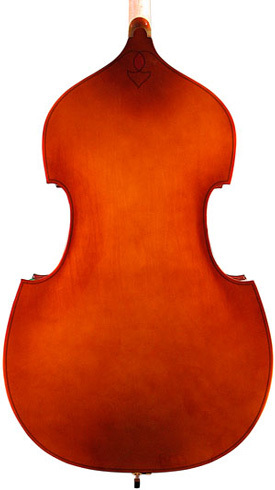 An upgraded version of the Concertino, which has a carved, solid spruce top. This is an economical way to improve the tone and response of a bass, without spending a lot more money. 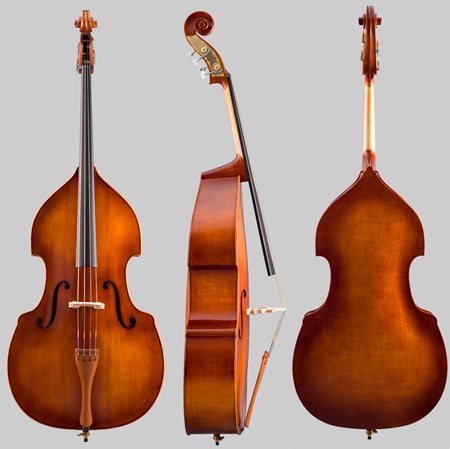 It's also a smart choice for dry climates, as the instrument is more stable, and will not require as much maintenance as a fully carved bass. Made for us by Eastman. 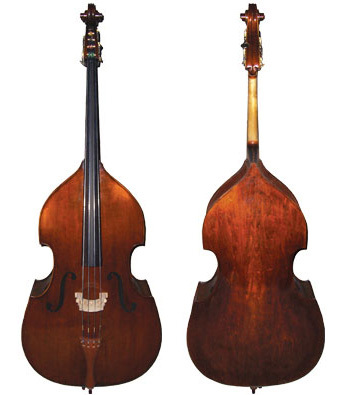 Same instrument as the Concertino Hybrid, but with a more attractive antique looking finish. Made for us by Eastman. This is a new concept. 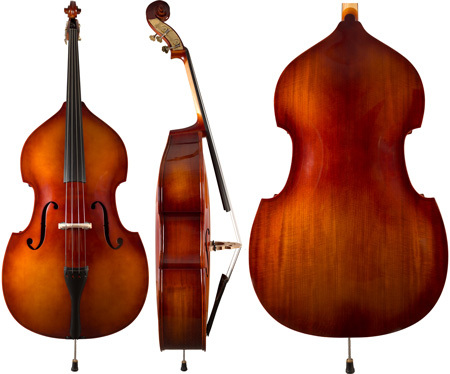 The top and back are solid wood for optimal tone and aesthetic appeal, but the ribs are laminated. This makes for a much more stable instrument in varied climates. 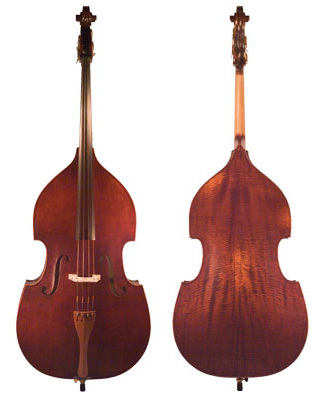 Same instrument as the Concertino Hybrid, but with a beautiful Maple veneer for the back and sides This model is the Busetto, but is available in the gamba or violin-corner style as well. Made for us by Eastman. Made for us by Eastman. This is the same as their model 305. 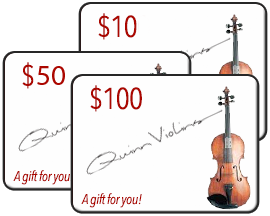 A very popular model nation-wide, and a very good overall value for a serious player's instrument. Carved top, laminated back & sides. A great value in a Chinese hybrid bass. Made for Korh by Concord "Christopher" brand. High Quality, Fully Laminated. 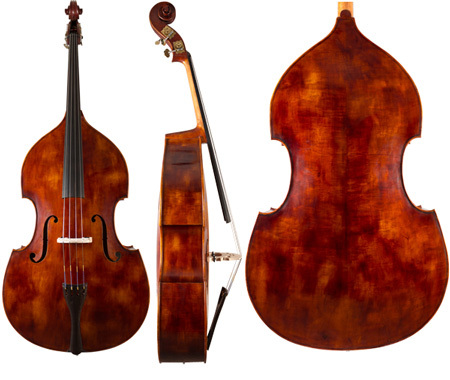 These basses are our top sellers, and for very good reason! Crafted using only the latest laminant technology. Only high quality materials used, including Madagascar ebony. Years & years of knowledge & experience maintain the highest standard of quality. Solid, hand carved spruce top, laminated flamed back and sides. Made for Kohr by Concord, "Christopher" brand. These are well known for consistently high quality in materials and workmanship. 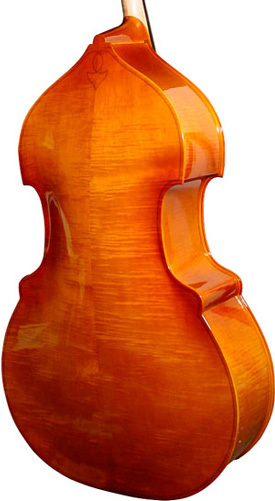 Made in Violin corner model, Busetto, and 5 String. Solid, carved bass. Tastefully antiqued, with European Spruce top. 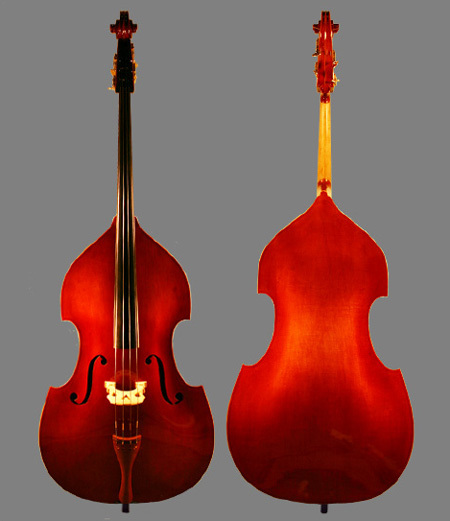 Fully carved, flat back bass from Romania. Maple back and sides have very lightly flamed wood.